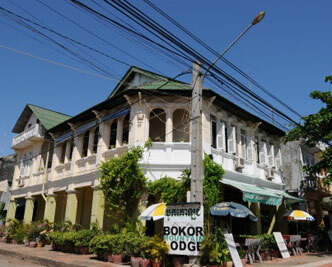 Bokor Mountain Lodge, previously Marco Polo, FCC, is a boutique hotel, restaurant and bar on the riverfront in Kampot. It has recently undergone a dramatic and extensive refurbishment and is now open as a hotel, bar and restaurant This beautiful old building has once again taken its rightful place in the lives of expats, tourists and locals alike. Nestling on the banks of Pek Kampong Bay River which flows to the Gulf of Thailand, the lodge is set amid wonderfully evocative crumbling French Architecture. In this setting, it is impossible not to dream of an age gone by while by; while dining or sipping drinks in the bar and passing the time of day with Kampots friendly and sociable local residents.